If you have a garden filled with beautiful, colorful blooms, it's always a bit sad to see them fade away at the end of the season. Drying flowers is a way to enjoy the beauty of the blooms when summer is long past. If you're in a hurry, oven drying is one way to go. Although most flowers can be dried in the oven, this method is especially suited to those with neat, compact blooms, such as chrysanthemums, echinacea, zinnias, cornflowers and marigolds. Cut flowers for drying as soon as the dew evaporates in the morning. Choose blemish-free flowers that haven't quite reached their peak, as younger blooms will hold up better during the drying process. If possible, select blooms that haven't been exposed to pesticides or insecticides. Place a piece of parchment paper on a baking pan or cookie sheet. Preheat the oven to the lowest possible temperature. Remove the leaves from the stems. Arrange the flowers on the baking sheet in a single layer, with the petals not touching. Leave the oven door slightly ajar to provide air circulation and to prevent the oven from getting too hot. Check the flowers often. Drying time can vary widely and may take several hours or only a few minutes, depending on the type of bloom and the temperature of the oven. The flowers are dry when they feel brittle and papery and the stems break with a snap. Remove the baking sheet from the oven and allow the flowers to remain on the baking sheet several hours or overnight. 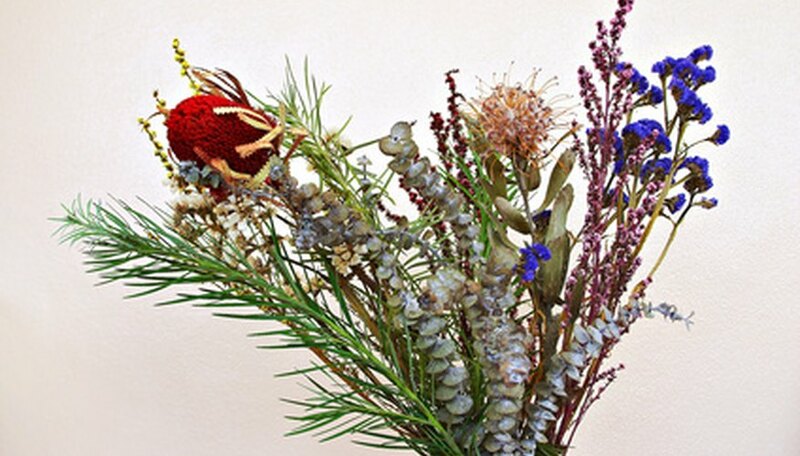 Wrap the dried flowers loosely in a newspaper and place them in a cardboard box. Store the box in a cool, dry room away from mice and other pests. Avoid storing the dried flowers in plastic, which can collect moisture. If you are unable to dry the flowers immediately, place the cut flowers in a vase filled with tepid water. Dry the flowers within 24 hours.